The Springer Law Firm, conveniently located close to you in Katy, Texas, believes strongly in providing skilled legal assistance to clients with family law, estate planning and probate concerns. We personally understand the struggles you are going through, and we will do everything that we can to make this situation easier for you and your family. We are led by our founding attorney, Sarah Springer. Sarah is an accomplished litigator and mediator, and has also served as a judge in Mississippi. Collectively, our lawyers have more than seven decades of legal experience helping individuals find answers to complicated legal problems. Your case is important to you, and presents challenges that are unique to your particular situation. It is our goal to put you in a position to achieve as successful as an outcome as possible. We negotiate with the opposing parties in the hopes of finding a resolution that works for all sides, but know that we are experienced and successful litigators. If trial is necessary, we are prepared to go to court to represent your interests. 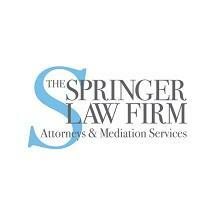 The Springer Law Firm is proud of the legal services that we offer to our clients. When you come in for a consultation, you will meet directly with an attorney who will explain the entire process to you. You can feel confident you have someone on your side at all times that truly cares about you and your case.